Once you move on from hand-washing dishes, there’s no going back. So when the dishwasher starts having problems, there’s no time to waste in getting to the bottom of it. You can always call in a plumber — and for some problems, you definitely should — but there are some small, common dishwasher problems that you can diagnose, if not repair, all on your own. Dishwashers are designed to not spill a drop, but leaks can develop if certain parts malfunction or become damaged. If you have an older dishwasher, some parts may be failing due to age and wear, which can also lead to leaks. Around the door. The door is lined with a rubber gasket, much like the one on your refrigerator door. If there is a tear in the gasket, or if it has become cracked and brittle with age, this could be the source of your leak. At the water source. A hose or pipe carries water from your household plumbing to your dishwasher’s water inlet. If this connection is loose or if a gasket has failed, water could be leaking from this area. Underneath the dishwasher. There are three places a leak can occur under here: the water inlet, the drain and the seal around the pump. Leaks in these places can be caused by loose or failed hose clamps, cracked gaskets or a broken pump. To get a good look around, you may need to clear out the area under your kitchen sink and remove the front kickplate of your dishwasher. Use a flashlight to look everywhere for the source of the water. If your dishwasher isn’t mounted to your countertop or cabinets, you may be able to scoot the dishwasher away from the wall to get a better look. Be careful not to snag or break any hoses if you do this. If you’re lucky, you may be able to pin the source down to a loose connection — something you can fix in under a minute. If it’s a failed gasket or pump, check your dishwasher manufacturer’s website for information on replacement parts and DIY repairs. You may find the instructions for these repairs surprisingly simple, and if it ends up being something you don’t want to handle yourself, your local plumber can always step in to make it a quick fix. The float switch is stuck or broken. The float switch is usually a plastic disc or cone that is attached to the floor of the dishwasher and is able to move up and down a few centimeters. When enough water has filled the dishwasher, the rising float switch is supposed to tell the dishwasher to stop the water flow. But if the switch gets stuck in the “up” position by soap scum or a fallen fork, no water will flow at all. This switch can also break, in which case it will need to be replaced. The door sensor is stuck or broken. 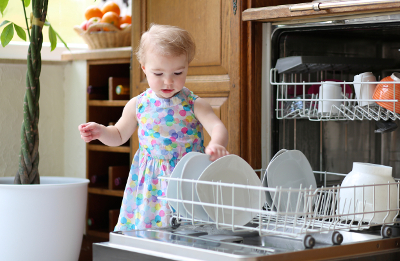 All dishwashers have a safety mechanism to prevent the flow of water when the door is not latched. If your latch isn’t “clicking” into place when you close the dishwasher, there could be a fallen object or some type of residue obstructing the latch. If the latch is functioning properly, it’s possible that the electronic switch that controls the water flow is broken and must be replaced. There’s a problem with the water supply. If you have water in the sink, you know the problem isn’t the main supply. The next thing to check is the valve under the sink that diverts water to the dishwasher. If that’s open, follow the supply hose to make sure it isn’t kinked. You may need to remove the dishwasher’s kickplate to see the full length of the hose. All it takes is the ability to look at your dishwasher from some new angles and identify a few parts, and you’ll be able to diagnose most water issues all by yourself. And if it turns out to be something you can’t handle yourself, you can always count on the pros at your local Rods Away.